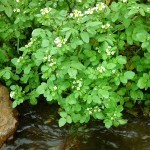 Watercress is a hardy perennial herb native to Europe and temperate Asia. It loves slowly flowing clear brooks, and was cultured by the Romans in irrigated gardens. Today it is mostly used as a culinary herb. 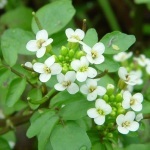 phenethyl isothiocyanate (2), the character compounds behind the pungent-cinnamic, sharp-green aroma of watercress . Etymology: Lat. Nasturtium, from Lat. nasus, nose; Lat. torqueo, turning, torturing; Lat. officinale, useful as a medicinal plant. Watermelon is a native of South Africa, but is now cultured all over the world in warm and dry climates. 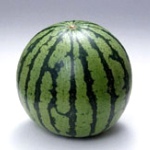 Numerous sorts exist, and lately seedless varieties have been developed (photo). A chilled watermelon is a blessing on a hot summer day. The watery, sweetish flesh has aroma notes in common with cucumber, although less green and with a fruity shading. Like in cucumber, the most important aroma compounds in watermelon are C9 metabolites of linolenic acid. 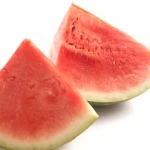 Beaulieau and Lea found that (E,Z)-2,6-nonadienal, (E)-3-nonen-1-ol, (E)-2-nonenal, and (Z)-6-nonenal were the most abundant compounds in five varieties of seedless watermelons . Fresh, watermelon-like notes have been popular in perfumery for several years. Melonal, an extremely powerful and diffusive odorant with a green-citrusy, melon-like odour, and Methoxymelonal, equally diffusive, but milder and with a very beautiful, transparent watermelon character. Melonal, for example, is used in L'Eau d'Issey (Miyake 1992) . This tiny, North American plant of the heath family grows in pine forests and on humid ground with sphagnum. The Mohicans and other Indians knew its effects, which are due to gaultherin, a glucose-xyloside of methyl salicylate . Like salicylic acid, methyl salicylate is antiseptic, analgesic and antipyretic. 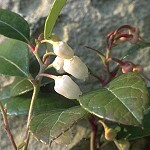 The whole plant smells of this compound, and formerly the so-called Gaultheria oil or wintergreen oil was obtained from it by steam distillation. 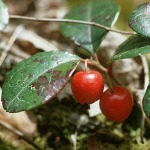 Etymology: Gaultheria, after the Canadian Dr. Gaultier, a botanist from Quebec; Lat. procumbo, leaning forwards. See meadowsweet for more about salicylic acid. 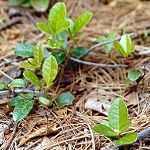 Methyl salicylate has a fresh, sweet-phenolic odour. In Europe it is mostly known from sanitary products. In USA, on the contrary, methyl salicylate is used as a flavour compound in chewing gum and root beer. 3(Z)-hexen-1-yl salicylate, having a more natural character. Another salicylic acid ester, benzyl salicylate, can be smelled from many flowers, e.g. carnation, Dianthus caryophyllus (Caryophyllaceae), and ylang-ylang, Cananga odorata (Annonaceae). It is used in perfumes of the L'Air du Temps type (Nina Ricci 1948). This climbing tree from South-East Asia is a common ornamental plant. 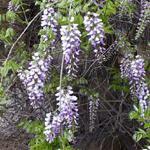 In temperate gardens it thrives on a sheltered wall facing south. 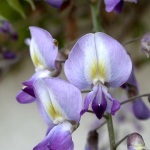 The fragrance of the wisteria flowers has fascinated perfumers for a long time - a pleasant, mild, warm and creamy sweetness with rosy, peppery and spicy nuances. Joulain et al. showed that the key ingredients of the characteristic fragrance are two unusual aromatic compounds, the beta-chromenes 7-hydroxy-6-methoxy-4H-1-benzopyran and 6,7-dimethoxy-4H-1-benzopyran . Moreover, 3-hydroxy-4-phenyl-2-butanone or phenylacetoin has been shown to be present .